Darlington Dragway has over four-decades of history with the International Hot Rod Association (IHRA). The legendary South Carolina track at one of America's great motorsports destinations has extended its IHRA partnership through a multi-year sanctioning agreement. The 1/4-mile drag strip was constructed by Harold Brasington, who built Darlington Raceway in 1950, and Woodrow Hall under the guidance of IHRA founder Larry Carrier. It opened in 1976 and has been a mainstay on the IHRA event schedule ever since. In 2015 new owners Russell and Dee Dee Miller took over the facility with the intention of transforming it into one of the premiere facilities in the country. The Miller family are true racers and their children, Tylor and Brooke, share the passion for the sport. Racing for the Pee Dee Fleet Motorsports Team, Tylor is one of the top Pro Mod drivers in the Carolinas, and Brooke is highly successful in the Junior Dragster ranks. She was runner-up in the track's IHRA Summit SuperSeries point standings for 2018, and won the Gambler's Race at the 2017 IHRA Division 2 Summit Team Finals. "Darlington Dragway is truly one of America's great drag racing facilities," IHRA Division Director Josh Peake said. "Not only does it boast such a rich history, but track owners Russell and Dee Miller and track manager Rhett Gardner have taken it to the next level. It continues to be a showplace for marquee events and truly lives up to its name as a legendary track." Since the Millers have taken over the Hartsville, S.C., track, it has undergone a massive transformation. In addition to a complete overhaul upon purchasing the facility, a new drainage system was installed in 2017, and last year, the first 750 feet of the track from the burnout boxes to about 150 feet past the 1/8-mile finish line was made all-concrete. The efforts of the Miller family and their resurrection of the legendary facility earned them International Hot Rod Association (IHRA) Track of the Year honors in 2016. 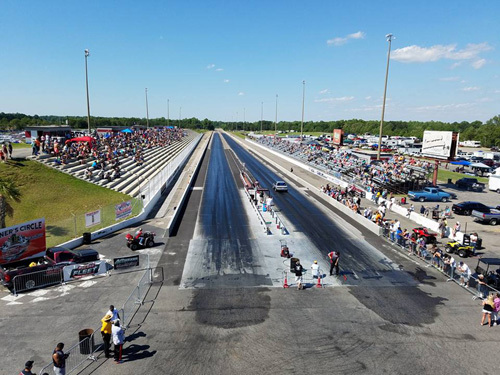 Darlington Dragway is scheduled to host more IHRA major events in 2019 with the IHRA Summit Sportsman Spectacular May 24-26 and the Division 9 Summit Team Finals September 11-15. Darlington Dragway hosted the IHRA Division 9 (Raiders) Summit Team Finals in October of 2018 and its group of talented drivers captured the overall team championship. Darlington drivers Steve Hilburn (Top), Perry Green (Mod) and Hunter Rogers (No Box) all reached the final round of eliminations. Hilburn also was the track's IHRA Summit SuperSeries Top champion for 2018, while other champions were Aaron Brock (Mod) and Morgan Carroll (Junior Dragster). For more information about Darlington Dragway, click here to visit the track's website.